Gin Gin (pop. 3,000) is 51 kilometers west of Bundaberg. This is where the Bruce Highway from Childers joins up with the northern access to Bundaberg. The town is in a part of what used to be Gin Gin Station owned by Sir Thomas McIllwraith, former Premier of Queensland. It was settled about 1847 by Gregory Blaxland and William Forster. The district was the haunt of the "Wild Scotsman" (James McPherson), Queensland's only authentic bushranger. He would lay in wait for the mail delivery and hold up the carrier. Eventually he was captured at Monduran Station and convicted at Maryborough. A re-enactment of the event is held on the fourth weekend of March every year. The society has purchased the police sergeant's residence to house the district's pioneering memorabilia. Gin Gin is an ideal rest stop, so why not stay at Country Comfort Gin Gin - Wild Scotsman Motel. 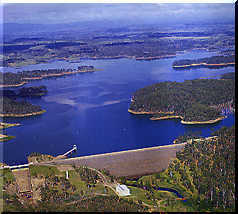 Source of the Bundaberg Irrigation Scheme, the lake has a capacity 1.6 times Sydney Harbour's and is held back by the Fred Haigh Dam. The turnoff is 19 kilometers north of Gin Gin on the Bruce Highway. The lake is popular for water sports, fishing, barbecues and picnicking.